← Welcome to the Wonderful World of Community Farming! I’m not exactly sure how this has happened, but ever since the international volunteers have started to come I’ve been busier than ever!! What is most excellent about this state of affairs is the number of things that are getting ticked off the To-Do list!! One of the big jobs that really needed to be done was to finally get the weaners (now growers, soon to be finishers) moved over to Maypenny Farm. I had managed to sort out enough electric fencing, a battery and battery-powered fence charger to make a decent-sized grazing area, but the hogs really needed a good sturdy shelter that could be dragged around from place to place in the field as we moved the pigs from one pasture area to the next. Me; [Keep in mind that my farm outbuildings are not exactly perfect – more like rickety, cobbled together structures that defy gravity and windstorms because if you use enough binder twine, zap straps, and duct tape, you can actually make something that’s remarkably difficult to deconstruct.] Do you think I would drive you crazy if we worked together? MC: [Exceedingly politely] I am happy to work alone. Poor MC. I don’t think he fully realized that the project would not start with a trip to the lumber yard. 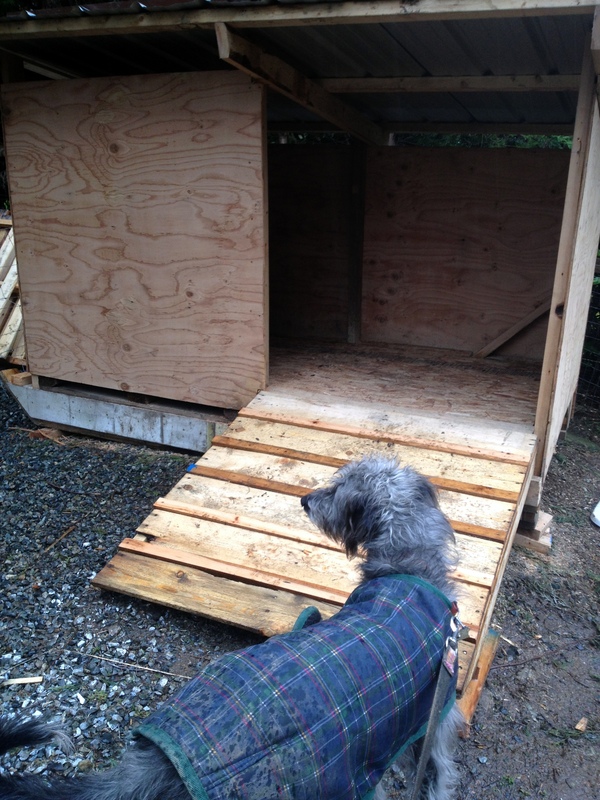 Instead, we collected together a pile of shipping pallets and I showed him where the heaps of scrap lumber and tin roofing were stashed (leftovers from the renovation) and gave him the nod. It’s not that easy to build something square and solid and neat when you are starting with experienced raw material that has just spent a winter under inadequate cover. Undeterred, MC set to work. There was a great deal of banging and the whirring and whizzing of power tools. After a remarkably short amount of time, I discovered THIS in the back yard!! German engineering on the farm… the new, fully-portable hog hut. 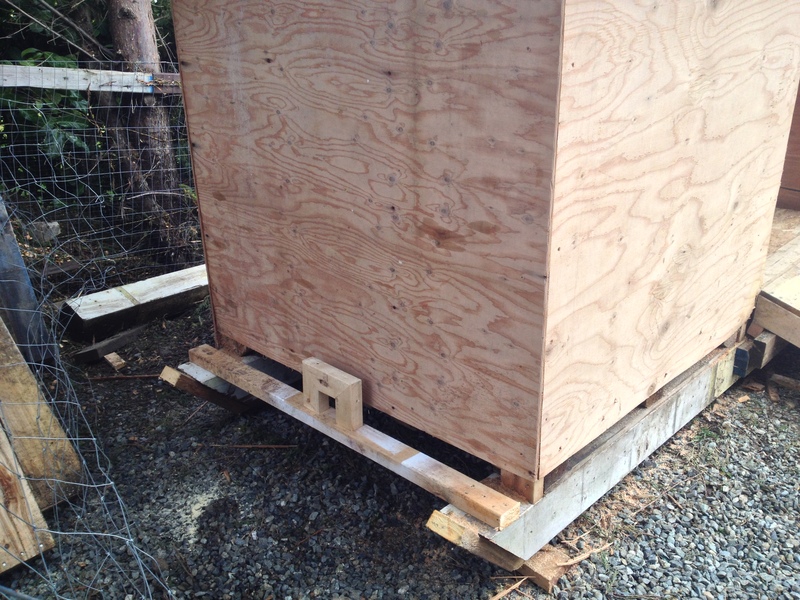 Undercarriage of the new hut… designed to be strong enough to pull behind the truck. Alas, it has been so wet since the structure got its walls we haven’t been able to paint it, but the building itself is GREAT!! At this point in the process, the hut was behind our house – a distance of about five kms from its intended new home. This meant we had to somehow move it from our farm over to Maypenny. When we realized it wasn’t practical to lift this heavy-duty 87-ton hulking hog hut into the back of the truck we decided to drag it up to the road using a strong rope and my big truck and then somehow get it into the horse trailer. 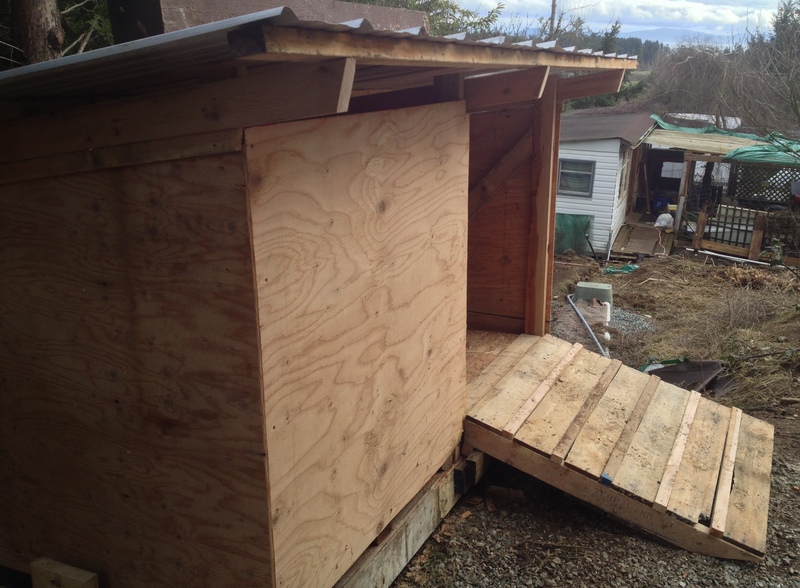 This entry was posted in Blog, DIY and Projects, Pigs, Uncategorized and tagged Dark Creek Farm, farm life, humor, pig housing, portable hog shelter. Bookmark the permalink. I love the concept of experienced materials and look forward to the next installment — we get the same feeling they had when they built the pyramids when we re-invent the wheel/levers/rollers/ car jacks — it’s what makes us Human!. Happy wrestling with the hog house! That’s a sturdy looking hut. Here in the midwest we called them hog sheds. Our sheds had runners under them, too. It was easy to slide them place to place in a field or field to field. Our farmland was as flat as a pancake. We didn’t have the challenges you speak of. I really like that. Simple, but very effective, which is how it should be.